The Green Ship Technology Europe (GST Europe) conference is one of the most important venues for sustainable shipping, attracting more than 450 international professionals from across the whole supply chain in shipping business and industry. This year’s focus is to present and discuss solutions to decarbonize the shipping industry and minimize its environmental impact. In this context, the innovative concept of HyMethShip is presented by the project coordinator Dr. Igor Sauperl and Paul Moeyaert, Exmar representative and Hymethship consortium member. 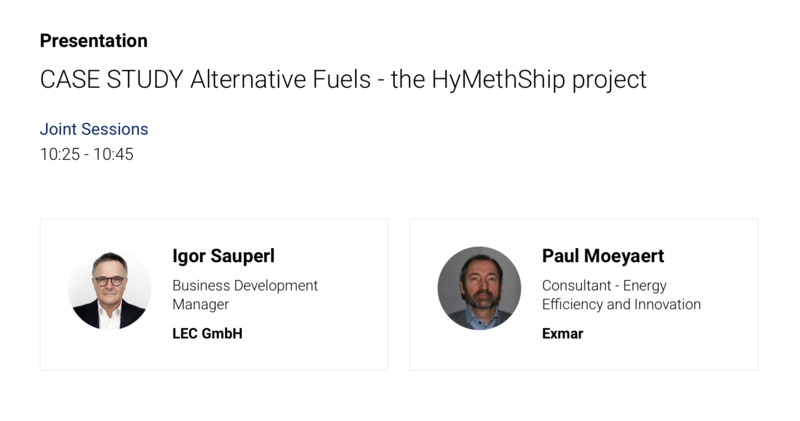 The topic of their joint lecture is “Case study Alternative Fuels – the HyMethShip project”. The conference tackles topics from emissions regulation and compliance, e.g. sulphur cap and BWM convention, and ecological impacts of shipping, like climate change, oceans plastics, etc. to case studies on circular solutions, harnessing renewables, etc.